before 16-yr old orphan kurebayashi teru's older brother souichiro dies of cancer, he gives her a cellphone and tells her that if she needs any help, to use it to contact a mysterious man who goes by the pseudonym of DAISY. she soon finds solace in the messages she exchanges with DAISY, he is kind and thoughtful, and he always there to encourage her when she is down. while teru is determined to make her own way despite her poverty and being bullied in school, that support is her lifeline, because whenever she is lonely, DAISY will send her email. in stark contrast to the comfortable relationship with DAISY, teru is working off a debt to the rude, inconsiderate, and obnoxious school janitor kurosaki tasuku. aside from those lovely traits, kurosaki is also lazy, a bit of a pervert, has a lousy temper, and is quick to use his fists -- but even though he makes teru do most of his own work, he also always seems to show up whenever teru needs help (being quick to use his fists is a bonus in that case). and help she needs, because not only does she get bullied, but some nefarious people are starting to hang around for reasons unknown. this is a shoujo manga, and at first glance it has some of the standard tropes: poor, flat-chested girl with a chip on her shoulders, tsundere  lead, mysterious hidden benefactor, cliche manly phrases like "i will always protect you", forced labour imposed by abusive man upon the poor girl. but the mangaka turns all of this deftly around. the protagonist is wonderful; she is a feisty little thing with a strong will and an equally strong sense of justice, and she also has common sense, and actual smarts. she does, in fact, not spend the entire manga naively unaware of who DAISY is, but makes an educated guess fairly quickly, and she figures it out soon after we do. the manga has a plot! an actual plot that's as important as the romance! a plot that mostly makes sense! the terms "hacker" and "cracker" are used correctly! the mangaka does not use misunderstandings and dumb mistakes to drive the plot; there are many opportunities for teru to screw up by being too trusting, or by listening to what (bad) adults in authority tell her, but she thinks for herself. you know how in slasher movies you often scream at the girl "don't go in there alone!!!" but she goes in alone, and gets slaughtered? teru does NOT go in alone, she does not blindly walk into a trap; she gets backup. mind, she isn't perfect; she makes mistakes, and has doubts and doesn't always do the right thing -- she's 16 years old. but she's never stupid, and the is the farthest thing from an airhead who can only think of boys. fortunately she also has DAISY to help out with chasing after the mystery, since DAISY is a computer hacker, and computers play a large role in the plot. teru's relationship with kurosaki starts out adversarial, but grows soon into camaraderie -- he picks on her; she gets him back good, they bicker and joke, and slowly become friends. their interactions are also very funny. and that's not the only relationship that grows -- teru also forms friendships with her brother's former girlfriend who becomes the school's counselor, and with some of the people who bullied her, and that's not just done in that vague "i forgive you because i am a kind and gentle person" way (which i never entirely buy), but it actually makes sense. something else that makes this manga stand out is its strong sense of pace -- the first part of the first volume is used to establish the character, and the second half the plot. we start out knowing nothing at all, and are fed just enough information to keep us interested; not too much all at once, but enough to make some educated guesses. we learn some things the protagonists don't know, but not all; we get to try and puzzle things out along with them. mind, this is not a western mystery plot, so don't expect miracles from the plot; i'm praising it within the context of its genre. by the end of the first volume the plot has become quite scary, and the mood gets more and more serious, and emotionally involved. in later volumes that gets amped, the humour takes a back seat, and things become heartbreaking for a while. the romance is very slow to develop, which is fine by me. 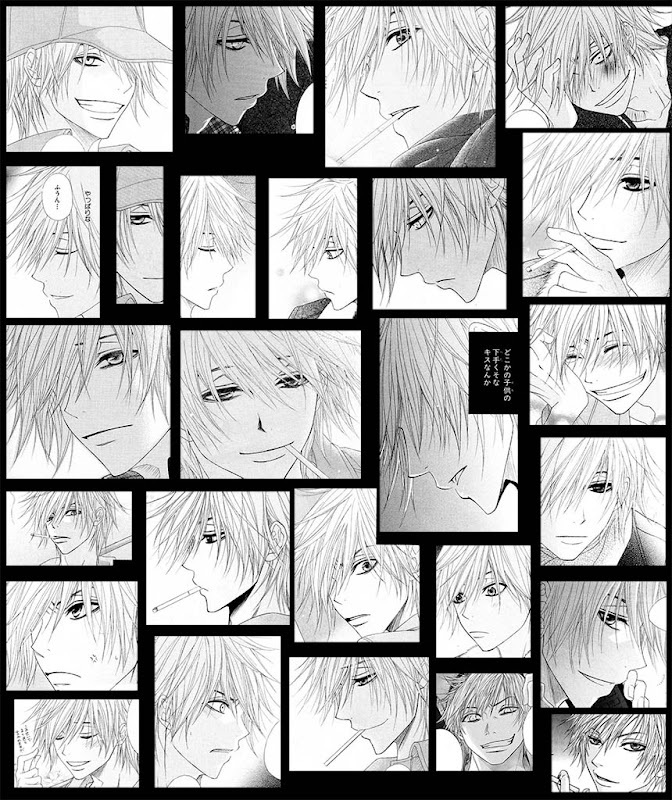 there is something deeper going on than romance between teru and kurosaki anyway. teru grows up a lot, and in the end, the phrase "i will always protect you" takes on an entirely different character, and who protects whom isn't cliche at all. man, i adore teru; she is such a great character. the art is good, in emotional moments it pops right off the page. especially when it comes to kurosaki, whose every fear and hope we can read in his eyes. the manga is at 8 volumes and still ongoing, though there's a major milestone in chapter 43, so one isn't left totally hanging should it stop unfinished (something i always worry about). it seems to have gotten quite popular though, so it'll probably continue.